The basic structure of these works was for 30 people assigned to different parts of the city or calling area to call at five minute intervals and describe something they saw at the moment; these reports were then broadcast live. Whitman put the incoming calls directly on the air as they came in, his only intervention being to end the call when, as he puts it, “The caller has produced a coherent image.” Ninety calls over a thirty minute period produced the final work. The news reports capture the nature of a specific place and time, revealing it to audience and participants alike. In subsequent performances of this work, Whitman used the latest technology available. In 2002 he worked with cell phones in Leeds, England; the cell phone calls were broadcast in real time on large speakers in a public square in the town. A recording of the resulting sound composition was made available by the sponsor, Lumens, on the internet at UBUweb. 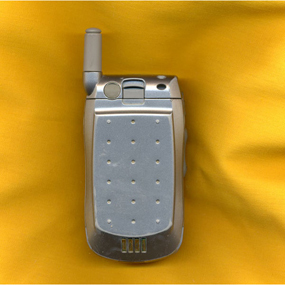 Now in 2005, Whitman continues to explore the newest communication technology: The participants will use camera cell phones to transmit voice and video reports to the central performance site, where information will be played and projected. The reports will be simultaneously streamed live over this website. While the technology has changed, what has remained constant in these works is that Whitman gets to know the area of the performance and works with local people in each location who know and love their town or area. Whitman uses their reports and descriptions to record and reveal the special nature of each place. Whitman creates with sound — and now with sound and images — a cultural map of a unique locality. Transformed by art, the local becomes universal.